fingerprinting device on the market today. With one clean innovation, ANDI delivers unique benefits to identity verification and security. The core technology reduces operating costs, labor, and training while increasing identification speed, convenience and cleanliness. What does Zero-Contact mean? For AOS, it means no operator and no user ever touches the system. Zero-Contact operation makes fingerprinting a simple operation. No platen to clean. No ghosts or latent finger prints to wipe away. 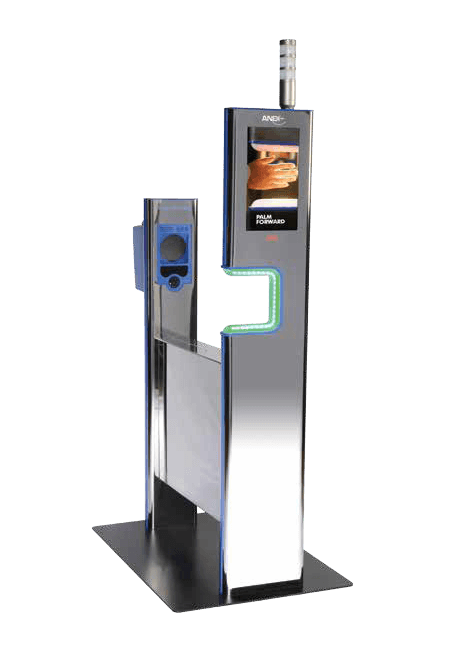 Zero-Contact at walking speed eliminates bottlenecks and long lines. Borders become more transparent and vigilance becomes more effective. Commerce increases while bad actors stay away. AOS technology makes fingerprinting simple and fast. Welcome to the new age of Automated Non-contact Distance Identity. ANDI OTG is the fast, accurate, zero-contact identity solution for enrollment verification, and access control. ANDI OTG is ideal for high security applications like border control, airport ticket verification, visitor management, ticketless event access, medical access, and checkpoint authorization. The simple- to-use OTG system takes user fingerprints at their walking speed. Custom implementations are available.